Also known as a boroscope, borescopes are optical devices designed for visual inspection work. These devices are used to measure areas that are inaccessible by other means and to detect imperfections and defects. Borescopes are great alternatives for measurement procedures that require expensive, time-consuming, or destructive dismounting activities. Borescopes are excellent tools to use to inspect automotive engines, diesel engines, truck engines, steam turbines, aeroderivative industrial gas turbines, and aircraft engines. With that in mind, what should you look out for if you want to purchase borescopes? Let’s find out more! In some cases, the size of the inspection camera matters. Bigger borescopes often provide sharper images but are not so convenient in operation. If you need to measure smaller areas, you are better off using smaller borescopes because they are more convenient to use. The tradeoff includes lower quality images and the lack of technology. When it comes to examining dark spaces in a cavity, you will need some form of illumination. To avoid contamination and heating problems (caused by incandescent lamps and bulbs), you should opt for quality borescopes that offer fiber optic illumination. This type of illumination features glass fibers that deliver light from an external light source. The light then travels through the borescope to the working end. 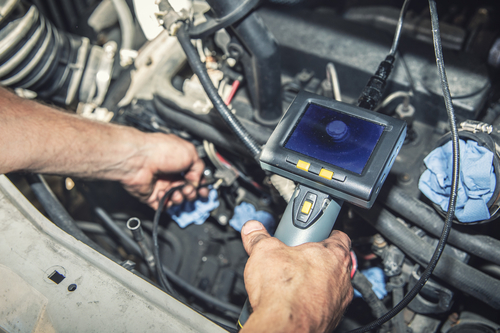 If you want to increase safety, efficiency, and convenience while getting work done, this is a must-have feature in your borescope. A good borescope does not require operators to refocus on a regular basis. It should have an almost unlimited reach. When it comes to calculating magnification, you can use a simple rule that works for both flexible and rigid borescopes, i.e. the level of magnification is often greater when the object is closer to the lens. Valves that are located near spark plug holes (automotive engines) are considered hard-to-reach areas. You can better examine these areas with a backward-looking 120° borescope. Depending on your measurement tasks, you should keep an eye out for different-angled borescopes. By changing your field or direction of view, you can inspect all the sides of a cavity. There are two main types of borescopes: flexible and rigid. It usually depends on the shape of the tube. In the case of flexible borescopes (non-articulating or articulating), the tube that connects the eyepiece and the lens is typically elastic. Rigid borescopes, on the other hand, feature the immobile version of the tube. This makes them a good choice for measuring items such as guns, hydraulics, cylinders, or fuel injectors. Your goal is to measure or inspect the area in the most efficient way. It is imperative that you choose a device that has the appropriate length and diameter. Longer tubes can cover more area while shorter tubes tend to be more precise. Camera tips with smaller diameters can investigate smaller areas. You get the picture. Looking for highly accurate and reliable borescopes? Look no further than Willrich Precision. All of our precision measurement instruments are competitively priced.